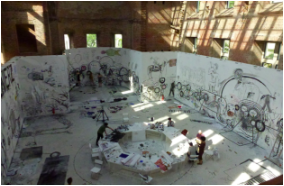 Artists & others are invited to participate in a short residency with Art Kibbutz, a collaborative project hosted by Venice Biennale artist Pawel Althamer, entitled the "Draftsmen's Congress" at New York's New Museum on March 23rd, 2014. This residency involves making of one large collaborative drawing that will take up the entire fourth floor space of the museum. We are calling artists, art students, art professors, graphic designers, architects, cartoonists, engineers and other individuals who draw as part of their profession to participate in this project.